Lavender Essential Oil Is One Of The Most Useful In Aromatherapy. Who can resist the light, fresh smell of lavender essential oil? This is probably one of the most versatile essential oils used in aromatherapy, and I certainly wouldn't be without it! In fact every home should have a bottle of lavender because it is capable of so many jobs. The one property that springs to mind straight away is its effectiveness in healing burns and scalds. Gattefosse, who helped the revival of aromatherapy in the 1930's, discovered this when he burnt his hand badly in the laboratory of his family's perfume business. He instinctively plunged it into the nearest vat of liquid which happened to be neat lavender essential oil. The burn healed astonishingly quickly and there was no scarring. This one property alone is reason enough to always have a bottle of this oil to hand! However, it is also a natural antiseptic, antibiotic, anti-depressant, sedative and de-toxifier. It stimulates the immune system and also stimulates the cells of a wound to regenerate more quickly. And the list of healing properties goes on...........! Lavender has been used as a medicinal plant for thousands of years, either in the form of fresh or dried flowers or as an essential oil. Although it is grown all over Europe, the best lavender comes from its original area - around the mediterranean. 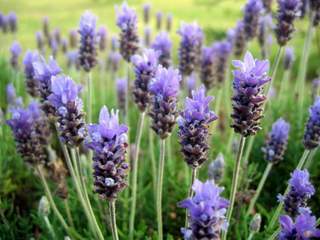 The word lavender comes from the latin word lavare meaning to wash. It was very popular with the Romans and all of their bathing activities! It is thought that they may have introduced the plant to England where it is a great favourite with the ladies! Often people associate the scent with their grannies - such a mistake! The pure essential oil smells quite different with a fresh, herbaceous aroma. Which variety of lavender should you choose? There are several varieties, with the most important being true lavender. 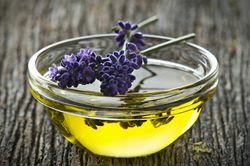 There is often confusion because this can be known as Lavandula officinalis(rarely found as an essential oil) or Lavandula augustifolia( most commonly available) or even Lavandula vera! 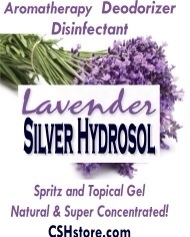 Spike Lavender is often considered to be inferior but it still does have its uses. This is an enormous plant which gives a lot of oil and so is cheaper to produce. It has a more camphor-like aroma. Lavandin is a cross between true and spike lavender and is the cheapest oil to produce. It smells much harsher and more camphorous and is usually used in soaps, lotions and detergents because the aroma lasts longer. It is important that you know the species of the oil that you are using, especially if it is for therapeutic purposes. Lavandin has the same calming and relaxing properties as true lavender, but ( and here is a BIG but) true lavender helps heal burns whereas lavandin can make burns worse. Lavadin is cheaper to produce, so you have to be careful, as some companies will sell a blend of true lavender and lavadin as "Lavender essential oil". It is so important to read the label for the scientific names so that you know which variety you are buying. I just love its great smell! I also like to make lavender soap, either using just a few drops of the essential oil or also including some flower heads in the soap mix. It is very relaxing, refreshing and therapeutic to put a few drops in a bath. It steadies the emotions and is very good if you have difficulty sleeping. It is also great for relieving physical fatigue - superb after a days gardening! - and nervous fatigue. If, like me, you only have a shower then put a few drops in some neutral shower gel to get the same effects. 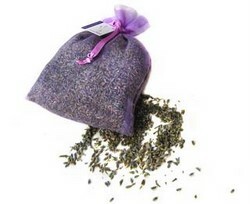 It is very easy to make your own sachets, pot-pourris and lavender water. If you suffer from headaches, then lavender essential oil gives excellent relief when massaged into your temples. Or try a cold compress on your forehead or on the back of your head. It is one of the most valuable oils for the treatment of acne and can also help many cases of eczema. Lavender is widely used as an insect repellant and insecticide to protect clothes and linen from moths and other small pests whilst also perfuming at the same time. Lavender oil blended with grapefruit oil will help you avoid being bitten by mosquitoes and midges. If you have already been bitten then some neat oil will help with the sting. It's also great for keeping animals free from fleas! You can begin to understand why lavender essential oil is so popular and one of the best-loved oils in aromatherapy. It has so many therapeutic properties as well as a great scent it can almost be claimed to be magical! 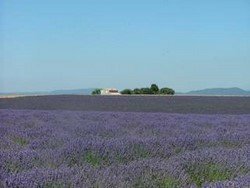 If you want to find out even more then why not visit What About Lavender, where you will find all the information about lavender you will ever need!